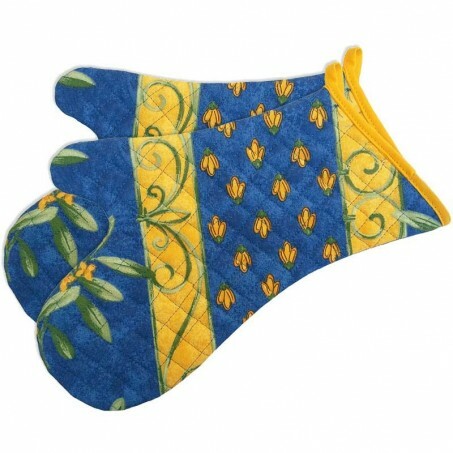 Indulge yourself with these heat resistant oven mitts that will allow you to grab hot dishes without burning yourself. They have a nice bevel cut to make them elegant on the arm. The polyester padding stitched between two layers of cotton protects from heat. The quilting remains thin for a better grip. The printed cotton also covers the inside and a yellow stripe matching the pattern of cicadas borders the top of the gloves. It forms a loop to suspend the fabric glove to a hook. The finish is very neat, and the shape harmonious. Our cicadas are appreciated by tourists. Moreover, they begin to be heard around the third week of June, until the end of August. Exactly at the same time as the influx of visitors who come to enjoy the warm sun of Provence. In order to enjoy them all year, the Provencal printed them on the fabrics (the cicadas, of course)! 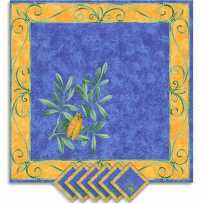 On the print of these blue oven mitts, a large yellow cicada basks on an olive branch. Bright yellow bands adorned with green separate the scene from a band covered with golden cicadas calissons. The decorations stand out in contrast with the blue background like a mistral sky. These oven gloves match the table collection of the same name. It is supplied in cotton or anti-stain cotton tablecloths, in all possible table shapes, including oval. Table accessories such as napkins, sets and even the breadbasket complete the Cigales line to compose a complete service. 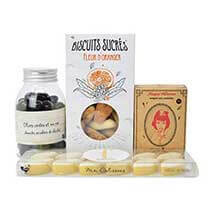 Feel free to look at the Cigales collection to highlight these emblematic cicadas on your table. Ces gants n'ont pas plus d'efficacité qu'un simple linge de cuisine. Il n'y a pas suffisamment de protection anti chaleur à l'intérieur. Ce sont apparemment des gants de décoration. Dommage que je ne puisse pas les utiliser. 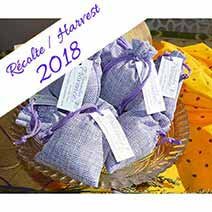 Nous sommes désolé que ce produit ne corresponde pas à votre attente. Il s'agit bien de gant de cuisine à utiliser de préférence avec des maniques.